U.S. Women’s Soccer star Abby Wambach returned from Germany to a hero’s welcome last week after her late header against Japan in the final of the Women’s World Cup had brought number one ranked Team USA within minutes of clinching its third Cup. The final drew 13.5 million television viewers, the most to watch a match on ESPN, nearly doubling last summer’s U.S.A.-Algeria men’s World Cup match. It also set a social media record as well, generating 7,196 tweets per second at its peak. When Wambach arrived in Rochester, NY for her first post-Cup Women’s Professional Soccer league match, she was met by a crowd of 15,000–large enough to break the fledgling league’s single-game attendance record. “You would have thought we won,” she said. soccer power, or resent us for butting into their game (especially if we started wielding our influence to change the rules)? Will soccer be America’s next pastime? in which a majority of Americans play soccer, but watch football. For the second straight year, tomorrow’s MLS All-Star Game in New Jersey will pit the American league’s all-stars–featuring the homegrown striker Landon Donovan and past-their-primers David Beckham and Thierry Henry–against the Premier League superpower Manchester United, which thrashed the Americans in their first match 5-2. And for the second straight year, more fans in the stadium may be pulling for Man U. It was a given when MLS was founded before the 1994 World Cup that sustaining Americans’ interest afterwards required their own league. It only made sense. Fandom is traditionally geographic; with rare exceptions, you root for the team nearest you. But because American fans came late to soccer, or at least late to appreciating the game’s complexities, their consciousness was molded in the era of the Internet and DirecTV. Let’s face it: Watching time-shifted Man U matches at home in HD is even better than the real thing. American soccer fans are a new species, the first truly global, post-geographic ones. “I think the problem MLS has–and they’ve told me this themselves,” says Markovits, “is that you can live in the middle of Brooklyn or Ann Arbor and follow more European matches than if you lived in Munich,” where most matches are pay-per-view. While MLS has struggled for 15 years to build critical mass in its fan bases, American fans have naturally gravitated toward the best teams on the field–which are all overseas. Major League Soccer’s strategy to cultivate homegrown stars for homegrown fans (with a Beckham thrown in from time to time) has been a failure. What American soccer needs instead, Markovits suggests, is its own version of Dirk Nowitzki, a transcendent player who almost single-handedly wills his top-tier European team to the title. The success of European players in the NBA–Nowitzki, Tony Parker, Pau and Marc Gasol, Hedo Türkoğlu–has been instrumental in creating support for more competitive leagues in those players’ home countries. 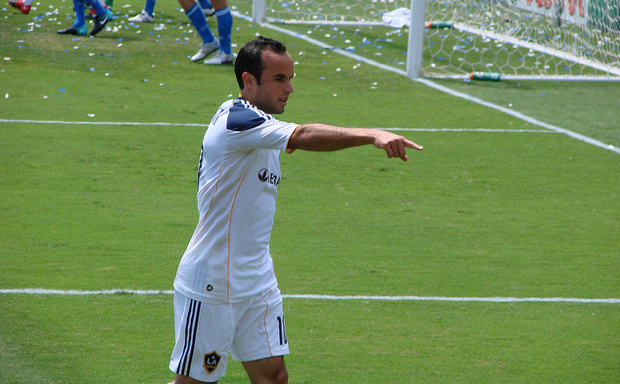 Instead of playing against Man U tomorrow night, Landon Donovan should be playing for them. There is another way. “The only way to spark an instant shift in the culture–the only total game-changer–is if and when the men win the World Cup,” Markotvits says. The stage is so huge and the stakes so high that maybe, just maybe, it could work. After all, the U.S.-hosted 1994 World Cup, with America’s improbable victory over Colombia, was instrumental in galvanizing a baseline of interest in the first place. In any case, that day may be closer than you think. “The U.S. is strong enough that if it has a good day and Brazil has a bad day, the U.S. will win,” insists Kuper. And then what? The reason American fans have gravitated to European teams is because they want to watch the best players in the game–homegrown and imported. Narrowing the gap between the best Americans and the best of the rest requires recruiting the best athletes, and therein lies the problem. That presents soccer with a chicken-and-the-egg dilemma: How do you attract the best athletes without being a dominant sport, but how do you become one without talent? The obvious shortcut is money. The NFL’s ascent to the pinnacle of American sports was predicated in large part on TV money, and the top-tier European soccer leagues are starting to catch up. Which means the entity in the best position to elevate soccer in America is ESPN. The network has made sports before. “Our network created college basketball,” anchor Bob Ley boasted to authors James Andrew Miller and Tom Shales. ESPN, they write, “is worth more than the entire National Football League, worth more than the NBA, MLB, and the NHL put together,” so why not soccer, too? There’s no reason America can’t be a soccer juggernaut; all the numbers suggest it should be. “The U.S. is a massive underperformer given its resources,” according to Kuper. The Soccernomics authors found that population size, wealth, and length of soccer experience correlate closely with success, which makes America’s hibernation confounding. The future of soccer could end up resembling a Budweiser spoof from a few years ago, in which the game is remade into “soccertainment,” complete with monster truck rallies and extra balls for extra time. “You do the football,” the tag line read. 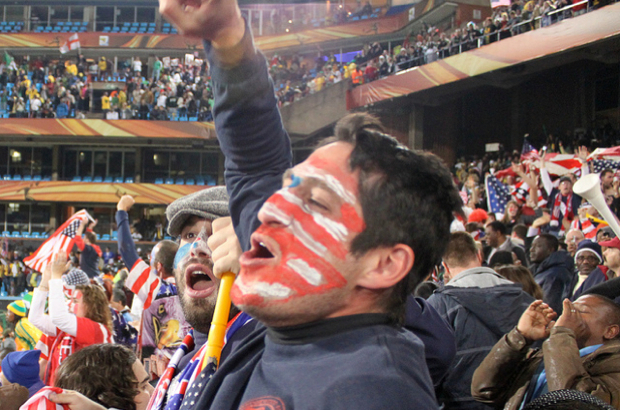 “We’ll do the beer.” Soccer aficionados would prefer America keep it that way.